I am a big fan of Dill leaves not just for health reasons but for the unique flavor and texture they bring to any dish. 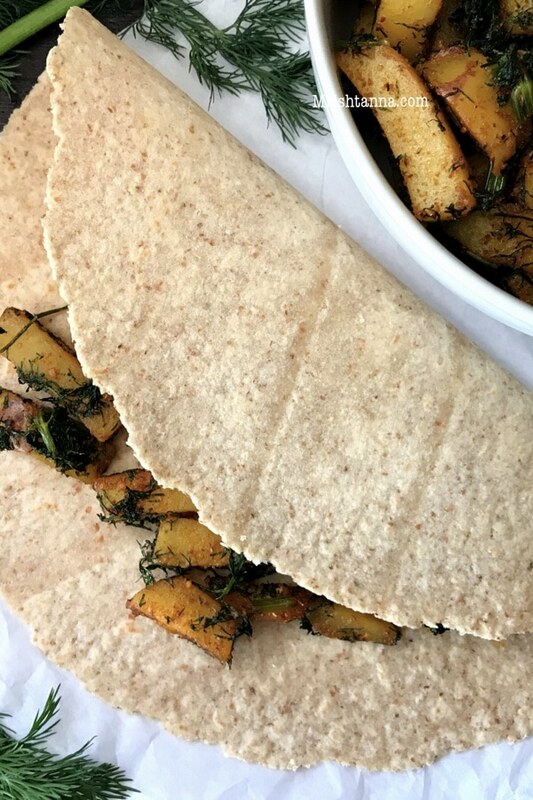 Todayâ€™s recipe for Dill Potato Fry is no exception when it comes to taste and texture. 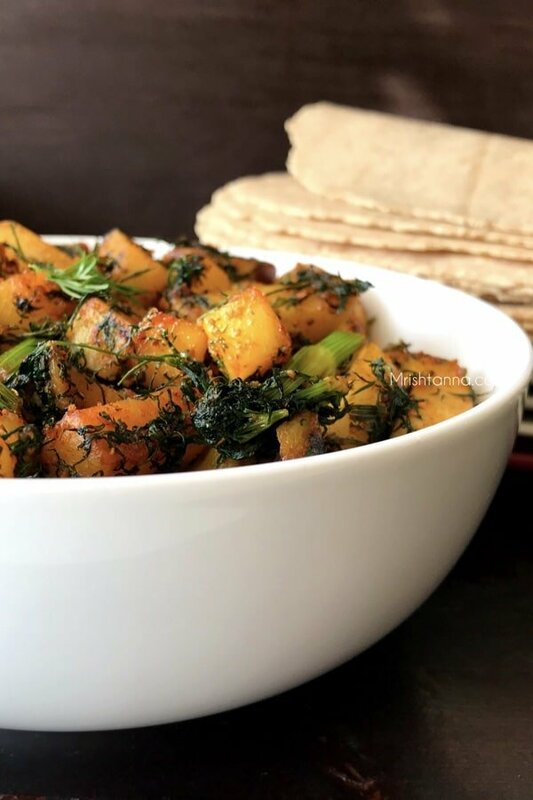 Sauteed Potatoes garnished with dill leaves is a unique flavor combination that pairs very well with flatbread or rice or even as a stuffing in veggie wraps or tortilla. Coincidentally, it was exactly a year ago that I shared a recipe for Dill leaves-Chickpea rice. It must be this time of the year that Dill leaves are blooming in full color. The vibrant green is just too good to pass when you shop for vegetables. Try todayâ€™s recipe and you will see it for yourself. For this recipe, I used homemade sambar powder as well as chili powder for spiciness, but you can always customize it to match your taste. I also added a little bit of Jaggery (brown sugar) and that is optional. You only need that if the potatoes are somewhat bland. I loved the unique combination of the sambar powder and fresh turmeric powder coated on the crispy potatoes. You could try the same recipe with sweet potatoes too. However, be sure to skip the brown sugar for that. Moreover, it would be a tasty snack by itself instead of pairing with rice or flatbread. The directions are very easy to follow and the ingredients list is not too long. All the more reasons, you should try this recipe today. If you enjoy delicious, vegan recipes such as this, get them directly in your inbox by subscribing to my newsletter. Just hit the subscribe button at the right. You will also get a copy of my e-book where I have put together some simple vegan dessert recipes and dessert essentials. My readers have found it very helpful and I am hoping you will too! Todayâ€™s recipe for Dill Potato Fry is no exception when it comes to taste and texture. 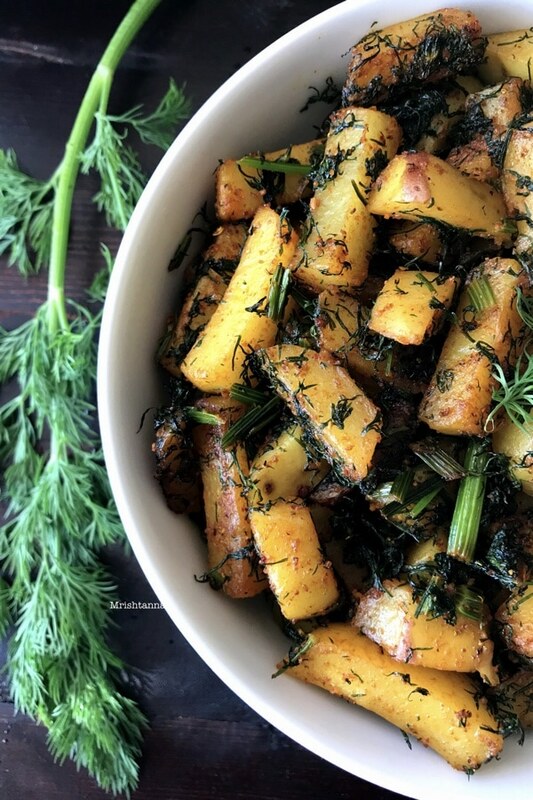 Sauteed Potatoes garnished with dill leaves is a unique flavor combination that pairs very well with flatbread or rice or even as a stuffing in veggie wraps or tortilla. Peel the skin off the potatoes. Chop them into cubes and wash them in cold water to remove any starch. Chop the dill leaves and place them aside. Drizzle a few teaspoons of vegetable oil onto a pan over medium heat and as the oil heats up, add potato cubes. Fry them for about 5 minutes and add the spices that I have listed in the ingredients: Sambar, Chilli & Turmeric powder. Continue to fry the potatoes until they appear golden brown. Now add the brown sugar and dill leaves. Mix well and let it cook for a couple of minutes. 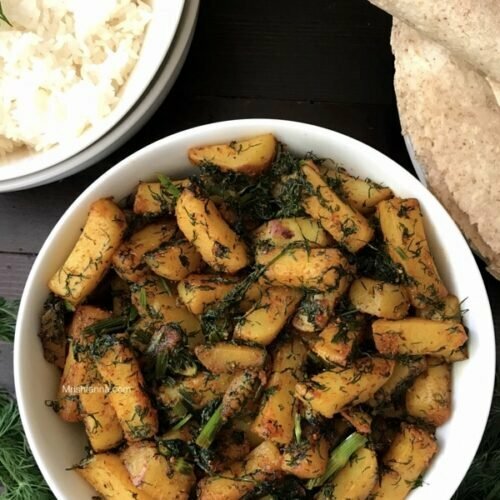 Dill Potato fry is ready to serve with rice or flatbread. Can smell the flavor of this ultimate potato fry rite from my lappy screen, feel like finishing that bowl as like a snack. Too tempting. The stir fry looks so delicious Uma.. The dil and potato fry looks so awsome, must taste good as an accompaniment to dal chawal too, will try this soon. I love potatoes. And your dill potato fry looks so inviting. I will try it soon. I have to admit that I am not a big fan of dill leaves but it is certainly a very healthy ingredient and I have tried cooking with it couple of times, but couldn’t really accept the taste and the overpowering flavour. The combination certainly looks amazing and for those who love this greens variety, would love this recipe for sure. 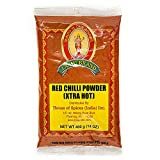 I like adding sambar powder too for potato roasts, they provide a great taste and flavour too. I am one of those people who are crazy about dill and so this stir-fry will be adding an extra zing when it accompanies my thayir sadam or sambar sadam. Give me a potato meal any day of the week and I’ll be the happiest person! These potatoes look so perfect for a quick and delicious meal. Wrapped in roti would be perfect for lunchbox too! YUM! We love Dill and always look forward to summer so can get hold of a giant bunch of dill, with potato dill sabji sounds delicious. Such a flavourful subji. Agree, dill has a unique flavour – I love adding them to pakora batter but have never paired it with potatoes. will try it. I guess once you start eating dill leaves you can add them to anything. The potato dill fry looks yummy. My family feels they can feed me anything with dill in it even in my sleep, well I wouldn’t dispute. so this is for sure done. Such beautiful clicks and equally delicious curry. I too add sambar powder to potato curry to jazz it up a bit. This one would have tasted so good with Roti.